#1 Why You Should Carry a Concealed Gun? While no one likes to think of getting hurt, the truth is that there are many situations where you could be in danger, especially if you away from the sanctity of your home. You want something that can help you to feel much safer no matter where you go, which is why many have opted to carry a gun with them. The truth is that there are many good reasons to carry a firearm of some sort the go way beyond simple protection. Here are some of the most important reasons why you may want to carry a concealed weapon with you. This is the most obvious reason. FBI statistics as of 2015 demonstrate that the number of assault cases were on the rise, and those numbers are only growing. This is why it makes sense to have some form of protection, especially if you are person who is forced to travel to your work or other locations by yourself. It does not matter where you are, if you have a firearm on you then you can be sure that you are in a much better situation to be able to protect yourself. Many crimes happen in a blink of an eye, and a person who has been trained and understands how to use a firearm is in a much better situation to be able to protect themselves. Interestingly enough, many crime statistics point to the fact that a person is more likely to be robbed if their spouse and small children are with them that if they are traveling by themselves. The immediate instinct is to do what is necessary to protect your family, which is something that most perpetrators take advantage of. Most will not fight back out of concern for their family. However, you can turn the odds in your favor by carrying a firearm with you. Consider the fact that it has been reported that it could take up to 18 minutes before a sheriff’s deputy or police officer responds to a 911 call. That’s way too much time, time where your family could be injured, kidnapped, raped, or murdered. Many are afraid to leave their home or apartment, especially at night out of fear of what awaits them should they walk out their front door. The world can be a scary place, especially if you live in an area where crime is a serious issue. Having a concealed weapon on you can help you to feel a lot more confident in your ability to head out the door. Not arrogant. Not thinking you are Dirty Harry or something like that, but simply confident enough to know that you can defend yourself should a situation arise. One of the benefits of having a handgun is the training that you have gone through. Most handgun safety courses will teach you about how to be better aware in your surroundings. This can also give you greater confidence, as your training has prepared you to be more alert in situations where you could be at risk. As mentioned before, it is likely that you will have to wait as long as 18 minutes from the time you make your 911 call until a police officer or sheriff’s deputy arrives. The amount of horrible atrocities that could occur to you or a member of your family during that time is unthinkable. Most of the men and women who don a police uniform do their best to help people, but when the average police response time is 10 minutes that is far too long for you to have to wait. You need to consider doing something that helps you to be able to protect yourself and those you love. The truth is you may not be able to count on anyone but yourself. A story that is not reported enough by media members are incidences where a person with a gun or a knife is harming others and a bystander steps in with their firearm and defuses the situation by either scaring off the perpetrator or stopping them from doing further harm. 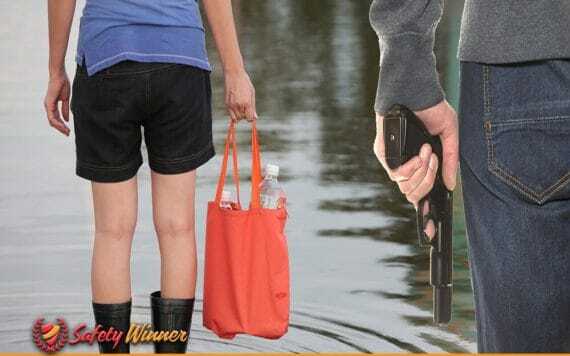 While many don’t like the idea that a person is carrying around a concealed handgun, the truth is that these good Samaritans are often the ones that stop situations that could have gotten a lot more tragic. Most people committing crimes believe that there is really no one to stop them. They may know the statistics of when police are likely to arrive or it could be some person who is hell-bent on harming others. There are many stories of an abusive spouse who tracks down their ex to do them harm, often shooting coworkers of their former wife or husband. These situations are diffused in many cases by a person who is carrying a firearm. Carrying a firearm may assist you in your job. You don’t have to be a police officer or security guard to see the need for having a concealed weapon with you. A person who takes money each night from a restaurant or other type of business to the night deposit at a bank is at risk of being robbed. Maybe you work in a location where you have to travel in a dark parking garage or you are required to carry items that are of significant value, like jewelry. Being able to defend yourself and the property and assets of your job can help you to feel a lot safer about both.